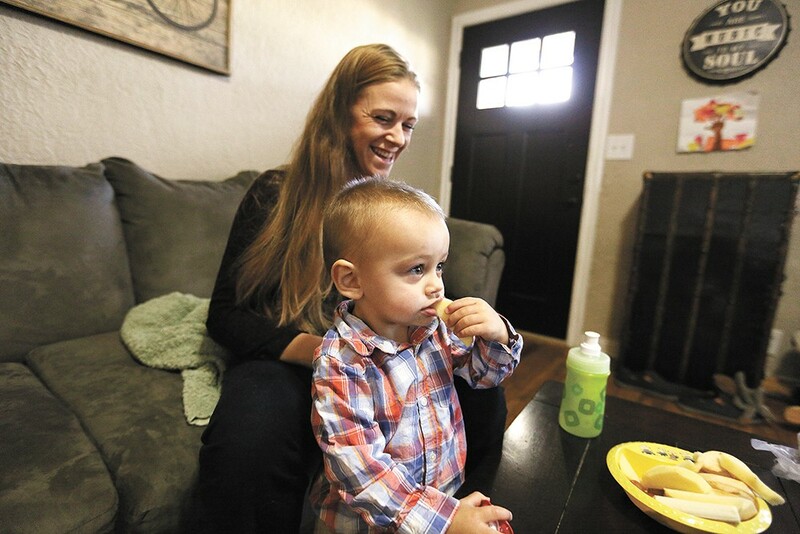 Brandaleen Harper and her son, Gabriel, are grateful for a new program called Complete Eats. Gabriel Robinson really likes tomatoes. And broccoli. And ba-bas. "He loves apples and bananas, all fruits are called 'ba-bas' though," explains his mom, Brandaleen Harper, as she stands in her kitchen on a recent Saturday morning. On any given day, as the nearly 2-year-old runs from the living room, to the kitchen, to the dining room of the Emerson-Garfield house where he and his mom live with roommates, he can easily reach for fruit- and veggie-based snacks in the baskets, cupboards and refrigerator drawers that sit at his eye level. As his mom holds up two giant Honeycrisp apples she just got on sale at the store, Gabriel reaches up, hands above his head, to take one. In one swift motion, he immediately brings the outsized fruit down to his mouth; half his face disappears as he takes a big chomp, then another. "Usually I peel them and slice them," the 29-year-old Harper says with a laugh. "We just eat them like candy." Raising Gabriel on her own, Harper says that every little bit counts when it comes to stretching her money at the grocery store. She makes sure they regularly eat fresh fruits and vegetables, and that cookies and sweets are saved only as special treats. That hasn't always been easy for the part-time daycare worker, who says she's doing everything she can not to wind up homeless again. This summer, though, she found some relief in a newly launched program called Complete Eats. For every $10 of Supplemental Nutrition Assistance Program (SNAP) EBT money spent on fruits and vegetables at Safeway, the store will automatically give the food stamp recipients a $5 coupon to spend on produce on their next visit. "If you spend $30 you're getting $15 back," she says, noting that's like cutting half the weight off the produce she buys by the pound. That puts things like avocados, mangoes, and pineapples back in reach of her budget. The program, paid for by a pass-through grant to the state from the USDA's Food Insecurity Nutrition Incentive dollars, applies to fruits and vegetables that are fresh, frozen or canned, but excludes items that have added salt, fat or sugar. The hope is, it will enable the type of healthy eating many low-income residents learn about through SNAP-funded courses. 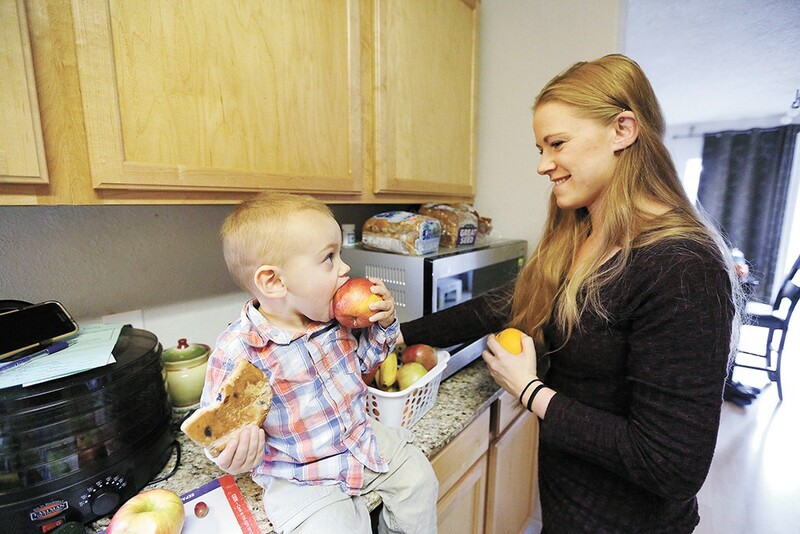 "We can tell folks to eat more fruits and vegetables 'til we're blue in the face, but if they can't afford them it doesn't really change anything," says Margaret Braun, lead community health worker with Spokane Regional Health District's SNAP education programs. Complete Eats, which the health district celebrated with a kickoff this month after glitches in the system were worked out over the summer, is tracked through Safeway's membership card, so customers need to check those coupons that print at the end of their sale, Braun says. "I never pay attention to the coupons, and we want to make sure the people who actually have EBT make sure they're not throwing away $5," Braun says. Brandaleen Harper: "We go through a lot of produce here." It's only the latest push to help low-income residents access healthier food. For about three years, resident community health advocates have handed out $10 Safeway produce vouchers during nutrition classes they help teach their neighbors once a month. "That's currency, basically," says Karen Murphy, as she holds one of the $10 "food prescription" vouchers in the apartment she shares downtown with her partner, Ruth Roberts. The couple, who will have been together 20 years next year, both work as community health advocates in their building, the Cornerstone Courtyard. They teach classes about once a month, with the curriculum and cooking supplies provided by the health district. They get a small stipend to hold a few office hours per week, where they can help direct their neighbors to doctor's offices, bus stops, food resources and more. "I was doing this anyway before, because people would ask me, 'Where do I find this?' and I'd look it up for them in the phone book," Murphy says. "Now I actually get paid for it, which is nice. I love it. I love people, and it gets me out in my community." Sometimes they teach meal planning, budgeting and recipes; other times it's a fun lesson mixed in with bingo, and on occasion, they'll visually show what nutrition facts look like. "There was the blubber burger, that was gross," Roberts says. "We broke down how much fat, salt, sugar was in a McDonald's meal. The fat, we measured out with shortening." The sugar was represented by sugar cubes. It was enough to make you think twice. Both women say they've also enjoyed learning so much about nutrition. Murphy has diabetes, so diet management is important, and Roberts says that after taking the classes, she got the confidence to ask about bariatric surgery two years ago. "I was in the program first, and we were like, 'We have to get healthy, gotta start eating healthy,'" Murphy says, looking at Roberts in the armchair next to her. "She came in and said, 'I'm gonna see about the bariatric surgery,' and got it." "It didn't help getting the surgery, but it helped me start eating nutritious so I could," Roberts says. "It got me to go to my doctor and say, 'Hey, I want to do this.'" Since then, she's lost about 180 pounds. Learning the skills, then getting the coupons that enable buying the things that've been talked about in the courses has had a significant impact on people, Braun says. "The stories behind this ability to purchase fresh fruits and vegetables are great. I get to hear those," she says. "'I can buy my daughter fruit this month.' 'I had blueberries for the first time in a decade.' Really. Seriously. ... Those things you and I just take for granted are real game-changers for these folks. Ten dollars can be a game-changer for these folks." Especially if they know how to shop sales. Harper says she's thankful she got to learn the ins and outs of grocery stores when she worked for Kroger; it's helped her learn how to use her coupons best. Recently, she bought about $40 worth of produce, and after she used $8 in Women, Infants, and Children (WIC) money, a $10 food prescription, a $5 Complete Eats coupon, and a store coupon for $5 off a $25 produce purchase, she spent only about $13.